This Hydrion pH Paper provides excellent color separation in both the acid range (below pH 7) and the alkali range (above pH 7). 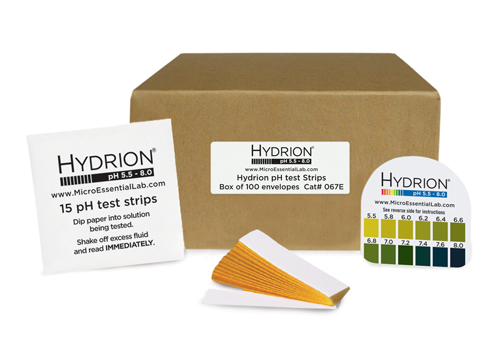 Commonly used to test urine and saliva, it offers an easy to read, single color match at every .2 to .3 interval from pH 5.5-8.0. Each carton contains 100 envelopes with a color chart and 15 strips per envelope. Provides for approximately 1500 tests. Dip the strip into the test solution, then instantly compare the resulting color with the matching pH color chart.